An exceptional piece of horse jewelry, this White and Yellow Gold Horsehead Pendant is sure to be the hit of the holiday season. Versatility is key here: this piece can be worn as a pin — gracing the lapel of a blazer — or as a pendant, paired with a gold chain to add sparkle and elegance to any outfit. Amazing detail work in bright white gold accents the leathers that form the circular edge of this piece, the perfect note of whimsy. The horse’s eyes are sapphire , the bright blue gem beloved by many and a perpetual holiday favorite. Look at the energy and spirit of the horse, rendered in yellow gold. The mane is fluttering in the wind, the ears forward and alert: here is a horse ready for adventure, eager for the day’s challenges. You’ll feel good just having this pin on: such vitality uplifts everyone who sees it! At 1.5 inches high and 1.25 inches across, this is a bold piece, ready to make an impression. Imagine her face as she opens that gift box and sees this shining there! This is a unique piece, for the unique horsewoman — someone not content with the run of the mill ordinary jewelry found in any chain jewelers! After all, your passion for horses and life long love of all things equine is your individual passion: why not have horse jewelry that is just as unique and one of a kind? 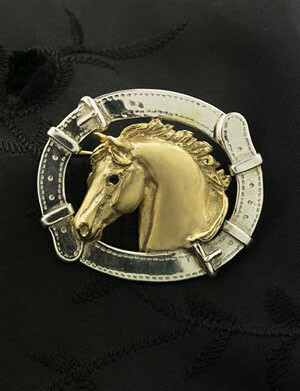 For the horse jewelry collector, this piece could proudly serve as the centerpiece or focal point of any collection. High quality craftsmanship, museum level sculptural detail, and the best of modern technique and classical design can be yours — but you’ll have to act soon if you want it in time for Christmas. This piece comes from England, home of the proud racing tradition, and requires a few weeks delivery time. Don’t delay if you want to be the one to present the most amazing horse jewelry ever this Christmas!